Another Grainline Studio pattern (love them) to follow Alder shirt dresses one and two. I’ve also made a Talvikki/Linden mash-up in a gorgeous French Terry and an Archer popover variation in double gauze. 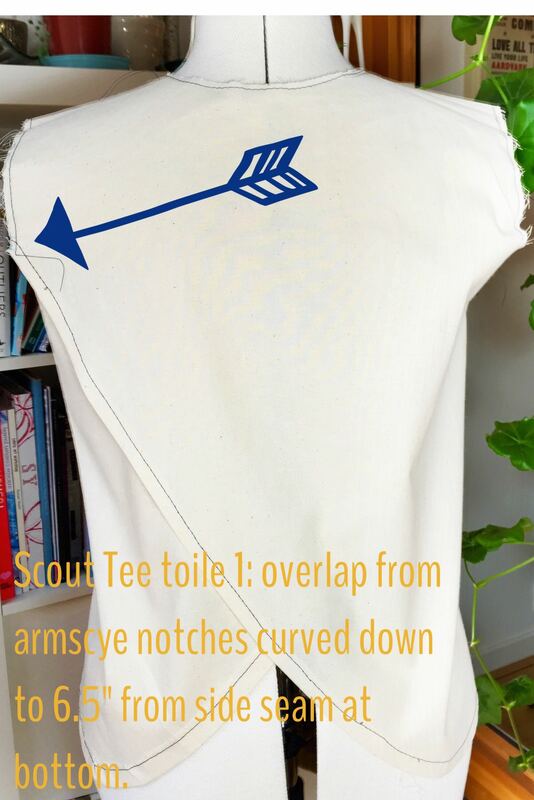 I’ve loved the look of the Scout Tee for quite a while and traced off the pattern looking forward to a quick make and new t-shirt then the Scout struck. It’s such a simple blank canvas of a pattern that I really struggled to decide what to do- a paralysis of possibilities! I ended up deciding to have a go at a split-back version; there are different versions of this out there and I had a play with 3. What I learned is that the way you make this depends on the look you’re aiming for. First up was toile number 1. 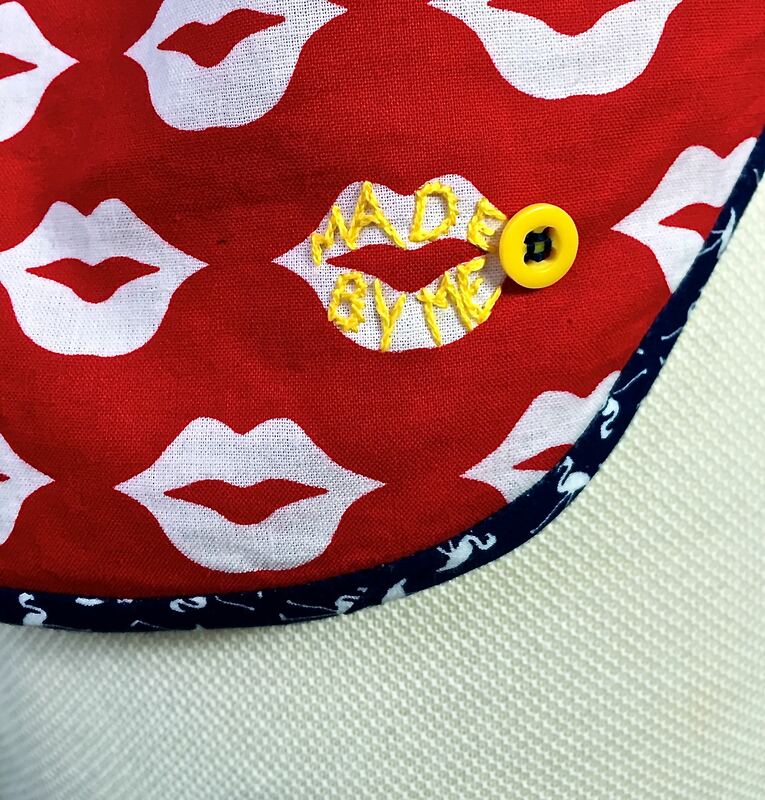 This was based on the great tutorial by Dixie Lee using two pillowcases. The join is done from the notches on the armscye. This means that pretty much the whole of the back has a double layer of fabric. For toile number two I redrafted the back and had the overlap stop at the end of the shoulder seam instead of going to the armscye. This meant less fabric and overlap but I still felt there was room to experiment. This one also felt like it had the most volume of the three. 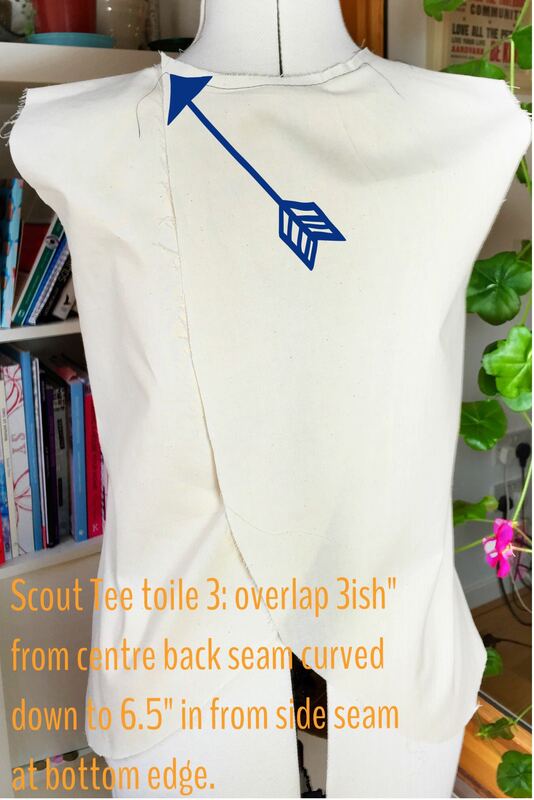 Toile number three was inspired by this fab Tiny Pocket Tank tutorial from the all dressed up and nowhere to go blog so my overlap started at (more or less) three inches past the centre back. I kept the line of the overlap quite straight until very close to the bottom. On all three I measured in 6.5″ at the bottom of the back piece from the side seam to start the curve. I made a couple of other adjustments to the pattern too. 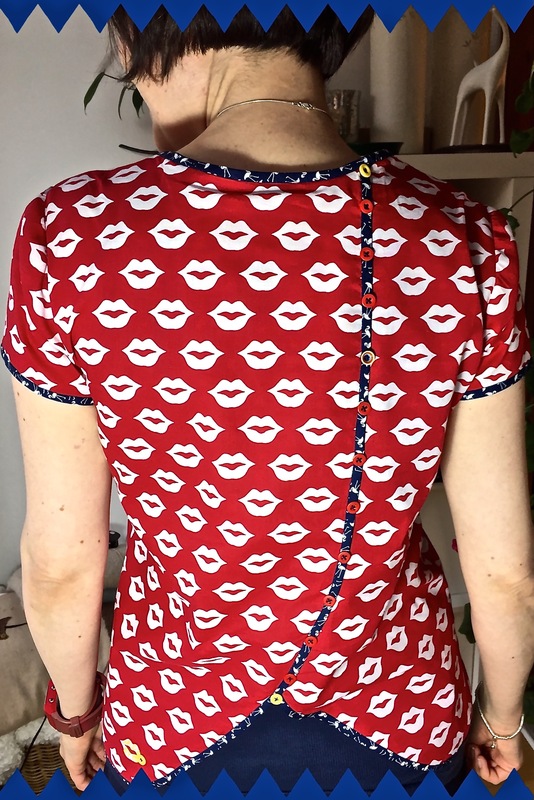 I had a bit of neck gape so removed about an inch from the front neckline as well as lowering it slightly and removed a quarter inch from the bottom of the armscyes for comfort. I also shaped the side seams in a bit (about an inch each side at the waist). The final change I made was to the length. I cut a size four, which was a good fit on me but used the size 18 length lines to make it a wee bit longer. So after three toiles I ended up going with number three. This was mostly because, for this version, I preferred the one with the least amount of overlapping fabric. If I made a Scout in a lighter fabric or one with more drape then I would probably have a go at versions one or two (definitely on the cards at some point). 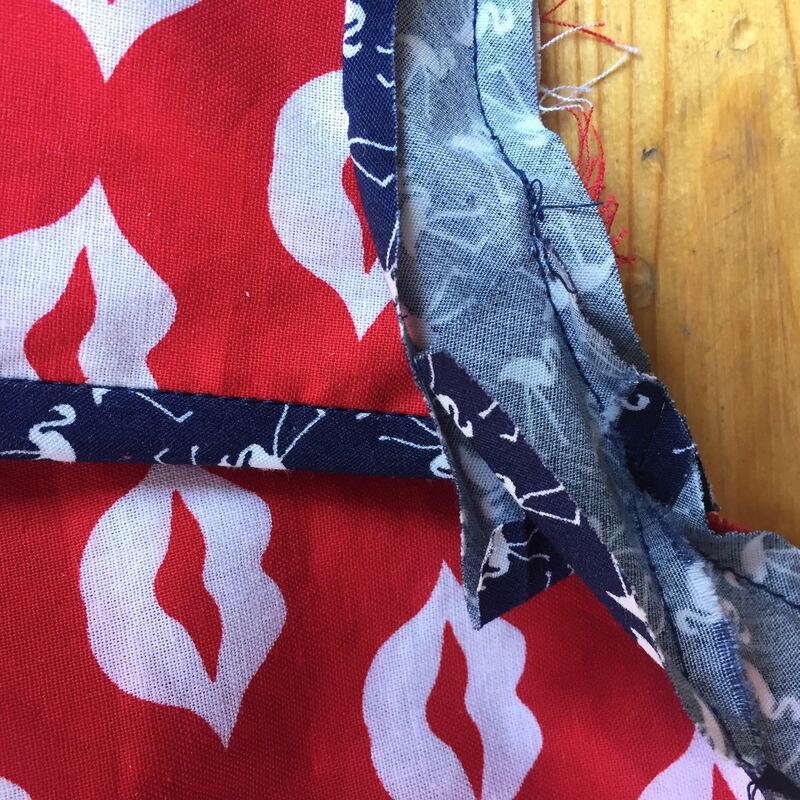 I picked a scarlet cotton with white lips printed all over it for the main fabric and decided to make bias binding to edge it (navy with tiny white flamingos- love it!) both from Remnant Kings. For once I remembered to measure my bias binding after I finished it so for future reference: a 55cm square of fabric made 9.5 metres of 1.5″ ( mixing metric and imperial) strips which I turned into double fold tape. After all that the layout, cutting and construction were pretty straight forward. 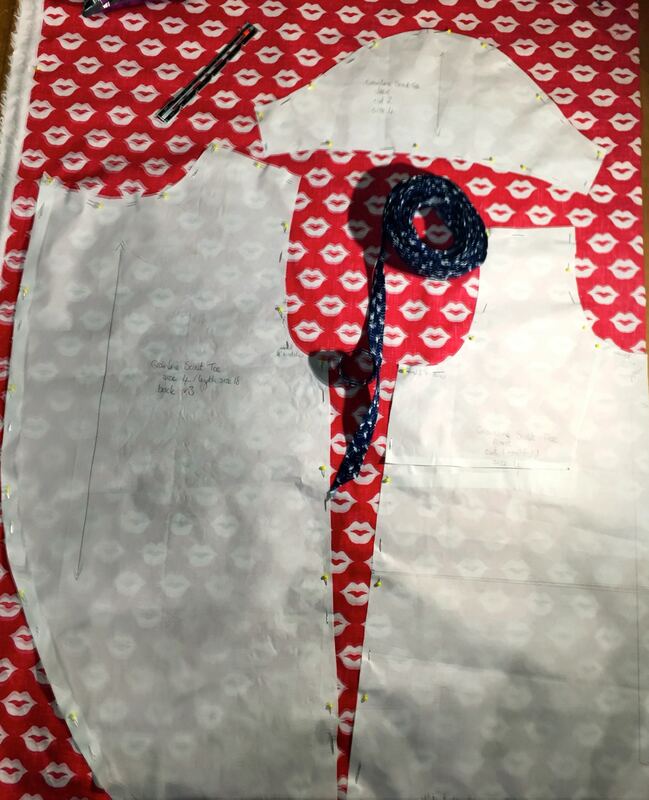 The sequence to make the tee up is pretty much the same with added binding steps. 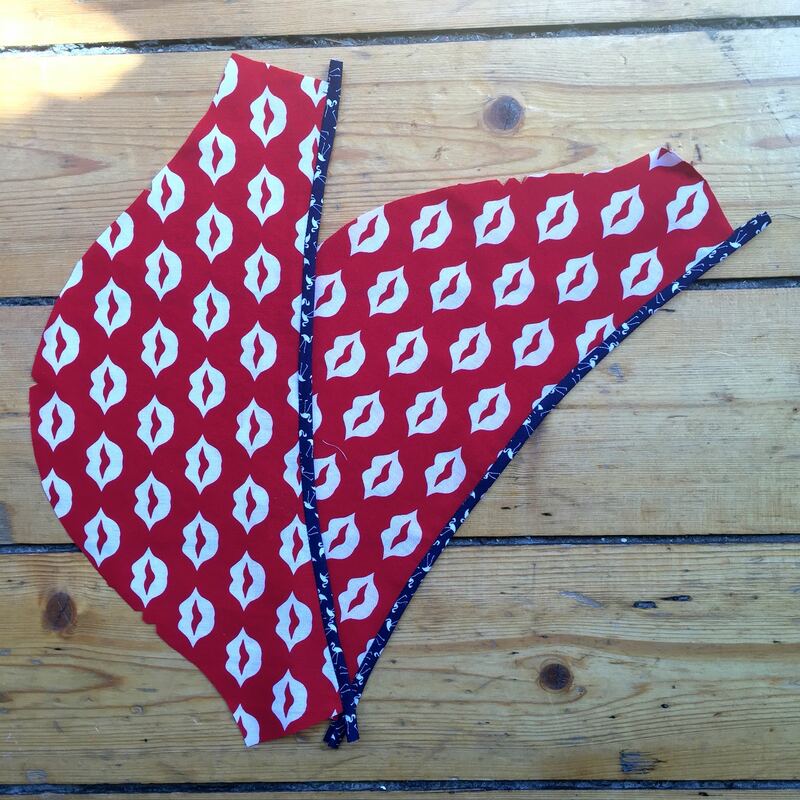 I removed the seam allowance for the curved back sections and bottom edge. I forgot to remove it at the neck edge and sleeve hems which thankfully didn’t really make any difference at the end of the day. I stay stitched the neckline and basted the back pieces together before anything else since I knew there would be a bit of on and offing to fit it and didn’t want any gaping. 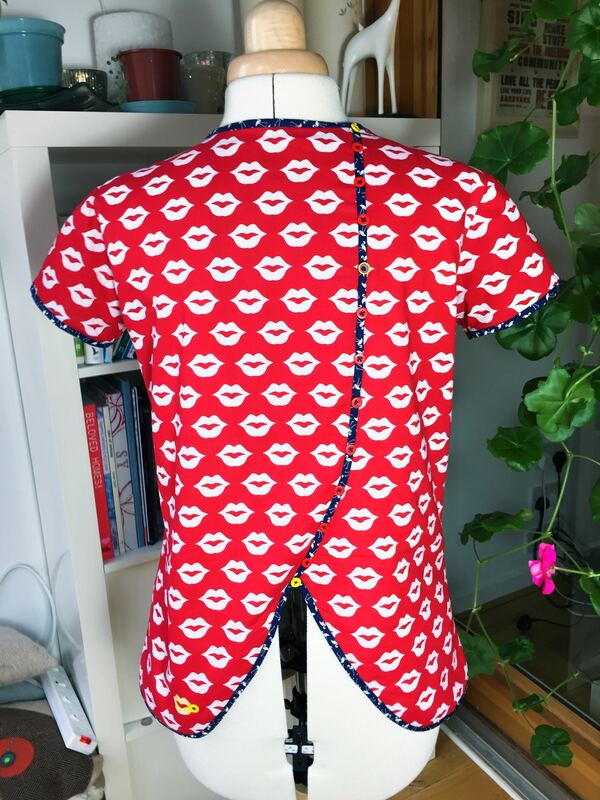 Then it was on to the shoulder and side seams before attaching the bias binding down the curve of one back piece, around the bottom edge and back up the other curve to the neckline. I bound the neck edge before adding the binding to the sleeves and following the pattern instructions for insertion. Job done! I think it depends on the look you’re after for a tee like this. The lose back means if can be quite floaty and voluminous because of all the extra movement the split adds which is fine if that’s the look you’re after. I liked the split back detail but didn’t want the volume so I bought some tiny buttons and used them to sew the opening closed. This means I can wear it without a vest under it and no fear of a peeping bra. 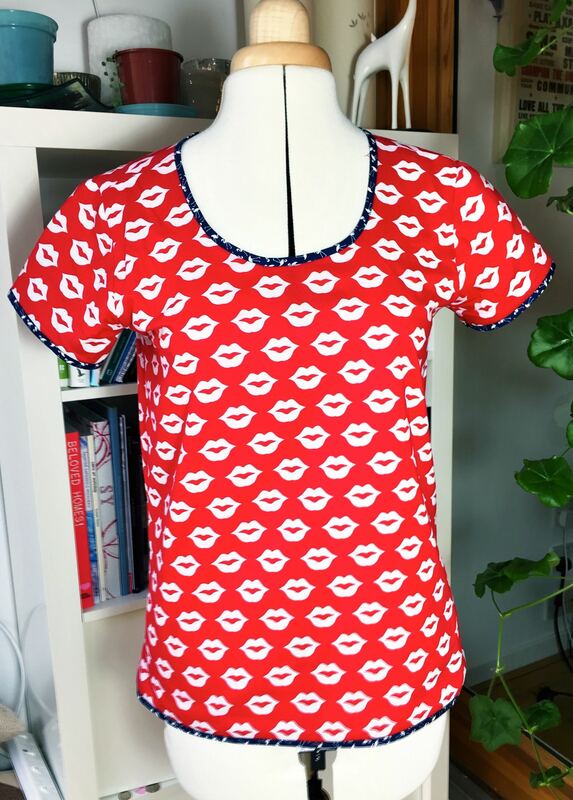 There’s a version of this in a lovely Japanese crepe here and a bias cut version in a heavier fabric here.